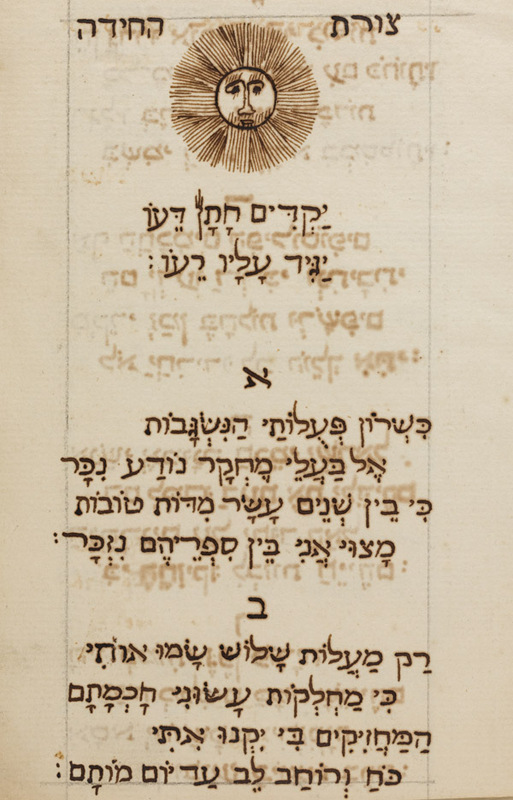 Riddle in verse by Isaac Cohen Belinfante for the marriage of Abraham ben Moses de Pinto and Judith daughter of Abraham Lopes Suasso. Laudatory poem by the same for David Franco Mendes and David Espinosa Catela. מתחיל תורת אלהינו בנפש חפצה וטובה, ה"ה הגביר/ ... כ"ר דוד אישפינוזא קאטילה/ ... בק"ק ת"ת בבית קדשנו/ ... וכדי לעורר את/ האהבה, כי החתן/ תורה הוא/ מלהקת המנגינים והפייטנים/ ובת השיר לו אהובה, אמרתי את שיר/ תשורתי ואשיר שירתי מפרי עץ הדר רטובה/ ועל מגילת ספר חקוקה וכתובה. Riddle in verse by Isaac Cohen Belinfante for the marriage of Abraham ben Moses de Pinto and Judith daughter of Abraham Lopes Suasso, Amsterdam 1771 (I), and laudatory poem by the same for David Franco Mendes and David Espinosa Catela as bridegrooms of the Law, Amsterdam 1764, copied by the author c. 1775 (II). Hebrew / Paper / 18,2 x 11,4 cm. / 8 ff. / Square vocalized, and unvocalised and Sephardic cursive writing (autogr. ).